Bring It! Live Fort Lauderdale Tickets - 7/24/2019 - Au-Rene Theater at Broward Ctr For The Perf Arts at Stub.com! Parking Pass Only. Does not include admission to event. Does not include admission to event. Tickets will be ready for delivery by Jul 20, 2019. These seats are located on the center aisle for this section with purchase of the entire group. These seats are on the aisle with purchase of the entire group. Upper Right, Upper Left, Upper Center Right, Upper Center Left & Upper Center Balcony, Rows E-N. Right and Left Balcony Boxes A and C. . Tickets will be ready for delivery by Jul 20, 2019. Lower Right, Lower Left, Lower Center Right, Lower Left Balcony, Rows A-D. . Tickets will be ready for delivery by Jul 20, 2019. Lower Mezzanine, Rows A-B. Upper Right, Upper Left, Upper Center Right & Upper Center Left Mezzanine, Rows C-K. Right and Left Mezzanine Boxes A-E. . Tickets will be ready for delivery by Jul 20, 2019. Upper Right and Upper Left Orchestra, Rows AA-NN. Right and Left Orchestra Boxes A-H. . Tickets will be ready for delivery by Jul 20, 2019. Lower Right and Lower Left Orchestra, Rows C-Y. Lower Center Orchestra, Rows Y-Z. 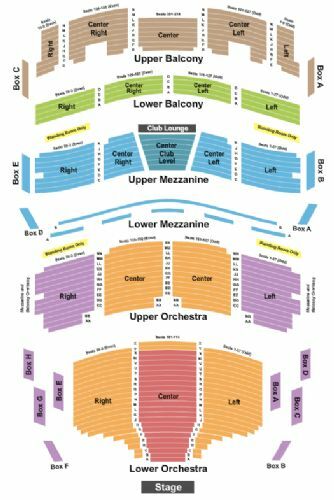 Upper Center Right and Upper Center Left Orchestra, Rows AA-NN. . Tickets will be ready for delivery by Jul 20, 2019. Upper Mezzanine Club Level, Rows C-J.. Tickets will be ready for delivery by Jul 23, 2019. Lower Center Orchestra, Rows A-X. . Tickets will be ready for delivery by Jul 23, 2019.